Posted by elizabethwong in Huh? !, Human Rights, Islam in Southeast Asia, Malaysia, Politics, Race Relations. The above is another gem of a proposal from the Institute for Islamic Understanding (an oxymoron?) and the Syariah Judiciary Department of Malaysia. Syariah Court of Appeal Judge Datuk Mohd Asri Abdullah even had to cheek to say that these non-Muslims should be charged in CIVIL courts. The most dispassionate response to all this nonsense is:- It is plainly unConstitutional. Pls go back and reread the Federal Constitution, Datuk. Posted by elizabethwong in Current Affairs, Democracy, Human Rights, Islam in Southeast Asia, Malaysia, Politics, Race Relations. For a split-second round about Christmas, I had thought that the panic over the possibility of the non-renewal of the Herald magazine’s BM section was state-manufactured, in order to make the Christians in this country grateful to the BN government for its benevolence and progressiveness, once the printing permit is granted. Indeed, most Christians praised their Lord and cried ‘Hallelujah’ at year-end. 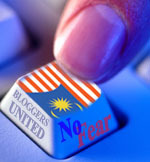 Posted by elizabethwong in Current Affairs, Democracy, Event, Huh? !, Human Rights, Islam in Southeast Asia, Malaysia, Note2Self, Politics, Race Relations. On Tuesday night when the Suaram Secretariat met, we were informed that leaflets with a photo of Sivarasa Rasiah, one of our founding members, were found in mosques, surau‘s, bus-stops etc. where there are large populations of Muslims. The message in the leaflet was to urge Muslims not to attend BERSIH Nov 10th gathering for free and fair elections, as it’s organised by ‘non-Malays Islam-haters promoting the Inter-Faith Commission‘ (paraphrased). The next morning, Latheefa Koya sent me a text message. Apparently there are five faces on the leaflet – Sivarasa, Tian Chua, Raja Petra Kamaruddin, Ronnie Liu and … me (!?!). Posted by elizabethwong in Current Affairs, Human Rights, Islam in Southeast Asia, Malaysia, Southeast Asia. WHAT IS THE MEANING OF 50 YEARS OF INDEPENDENCE IF THE STATE STILL USES THE ISA? Today August 1, 2007 marks the 47th Anniversary of the enactment of the notorious Internal Security Act. The ISA of 1960 was originally enacted to succeed emergency laws aimed at combating the communist insurgency during the 1940s and 1950s, has since then been used against those who commit acts deemed to be “prejudicial to the security of Malaysia”, or threatening to the “maintenance of essential services” or “economic life”. The government arbitrarily determines which acts fall into these categories and, using a loose interpretation of the legislation, has detained scores of individuals under the ISA, among which are prisoners of conscience, trade unionists, teachers, religious activist and community workers. We are celebrating 50 years of independence but what is the meaning of it if the state still uses ISA by detaining persons without trial and without any form of judicial process? […] Previously, the Tambak Paya Umno Youth division had put up a similar banner at a hawker centre there to warn others against discussing the May 13, 1969 racial riots. My mates in Suaram had once anointed me “penyajak yang paling teruk di dunia” (ok, i confess they used words not fit for posting), so it is only right that I pen these few lines for Umno Youth. Kontrak dan projek, semua dah beri pada you. Keris-keris pun dicium oleh you. Gadis cun pun nak ikut sama you. Posted by elizabethwong in Democracy, Human Rights, Islam in Southeast Asia, Malaysia, Note2Self, Politics, Southeast Asia. To kill two birds with one stone is to have the majority view advocate for jurisdiction be placed in the realm the Syariah court, and the dissenting view aim at satisfying the detractors. This is, after all, an election year. Posted by elizabethwong in Islam in Southeast Asia, Malaysia, Politics, Southeast Asia, Women. Is it my imagination, or does Umno actually enjoy provoking us during particular times of the year, like on International Women’s Day and just before Mother’s Day? House Leader of Opposition, Lim Kit Siang linked the incident in Parliament with the breakup of families by the state religious authorities. Thankfully, Parliament session is in recess. Posted by elizabethwong in Current Affairs, Islam in Southeast Asia, Malaysia, Politics, Readings. Anne James, the celebrated thespian of Malaysian theatre, like many of us, is very angry. There has been an abundance of legal-speak of laws and constitution, and ‘falafel-ing’ known as intellectual discoursing. But Anne straight-talks to the judges at the appellant court, the religious authorities and the powers-that-be, in the language we understand and employ. Posted by elizabethwong in Human Rights, Islam in Southeast Asia, Note2Self. This is getting very tiresome. An apt corresponding title to this emo post should read, “Darwin, Islam Hadhari and Freaks of Nature”. Two weeks ago, CIJ‘s Sonia called up to check if it was indeed Darwin‘s The Origin of Species on the gazetted list of banned book. Preferring to err on the side of caution and referring to the author’s name in the gazette – ‘F.susilohardo Basuki Hernowo‘ (line item 51) – I told her it was most probably some Indonesian Christian book. Last night, a foreign correspondent telephoned to make the same inquiry. After the conversation, I thought it best to have this checked out with some friends. This morning, well, one should by now anticipate the not-so-stunning news. 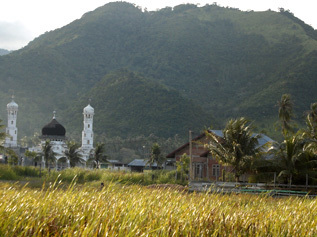 Posted by elizabethwong in Islam in Southeast Asia, Malaysia, Photojournalism, Travel.